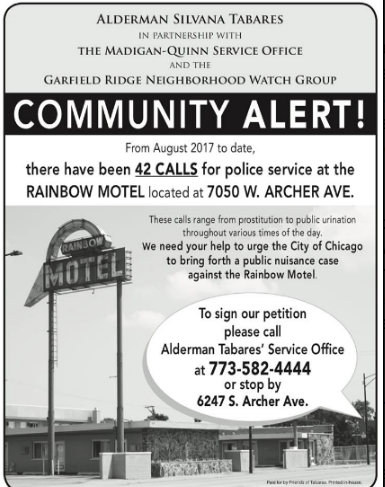 petition urging City Hall to bring a “nuisance case” against the Rainbow Motel, 7050 W. Archer, the Chicago Department of Business Affairs and Consumer Protection has handed motel owners a suggested plan of improvement. 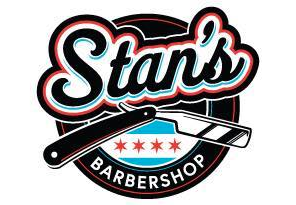 Tabares and 13th Ward Ald. Marty Quinn that the motel is a haven for misdemeanor crimes like prostitution, drug abuse, public urination and defecation, harassment of local school children and more. A nuisance case can be a first step towards revocation of a business license. Marianne Rieger said the process—in which BACP brings together businesses and neighbors with concerns—is successful a majority of the time. In the conference room on the eighth floor of City Hall on September 11 were Rieger and another BACP employee, Tabares, Quinn, five GRNW members, Chicago Lawn (8th) District Commander Ronald Pontecore and two members of his leadership team, and five men who said they were either owners or employees of the Rainbow—as well as Rainbow’s attorney, Adeena J. Weiss-Ortiz. 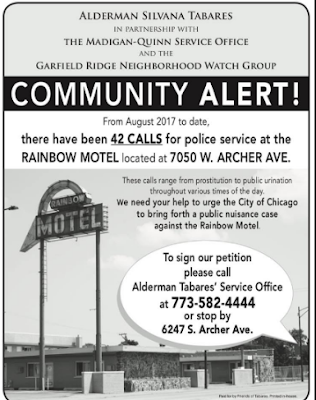 After hearing the views of Tabares and Quinn, as well as various complaints from each GRNW member and Pontecore’s assertion that CPD has received 46 calls for police service at the site since January, the Rainbow’s owners and employees—who signed in but did not identify themselves verbally—answered several basic questions from Rieger about the motel’s operation. 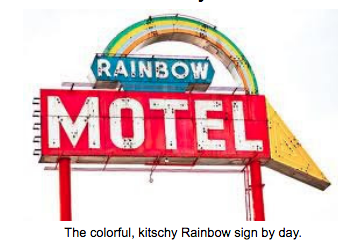 Rainbow representatives appeared to disagree among themselves somewhat on exactly how many people they employ, how many rooms they have for those seeking lodging and how many security cameras they have installed. When asked if their security cameras are linked to OEMC (the Chicago Office of Emergency Management and Communications), one Rainbow representative asked what OEMC is. An increasing number of businesses and even homes across the city have voluntarily linked their cameras with OEMC, to provide extra sets of eyes for police. 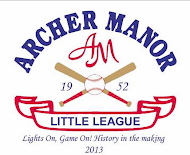 • Keep a log of registered guests and visitors, and make that available to BACP, to ensure that no more than two people are in any room at any given time. • Maintain a cleaning log showing that both the inside and outside of the premises are cleaned twice daily. 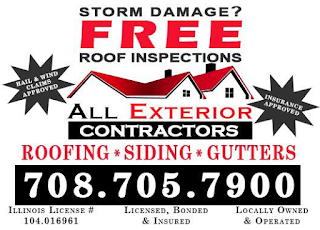 • Keep a log of calls made by motel employees to 911, reporting suspected criminal activity. • Link their security cameras to OEMC. 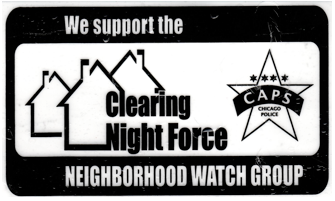 • Increase the hours of their security staff from 10 p.m. to 6 a.m. Friday and Saturdays to 3 p.m. to 6 a.m.
• Reach out to the community to address concerns, by attending CAPS Beat 811 meetings, as well as GRNW gatherings. At several points in the meeting, Weiss-Ortiz pushed back against the list, questioning whether BACP has the legal authority to make some of the recommendations. Rieger herself pushed back by saying if the Rainbow Motel chooses to contest the voluntary suggestions, BACP would be willing to make the next meeting a disciplinary one. 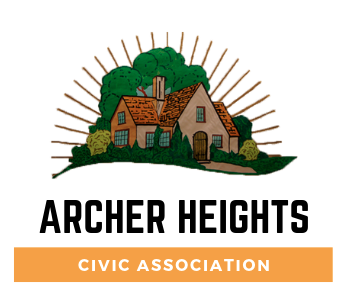 Rieger said BACP will meet again with Rainbow representatives to check on compliance at 11 a.m. Friday, Oct. 12 in Room 805 of City Hall. Presumably, Tabares and Quinn will attend again and invite those who have signed the petitions to join them. 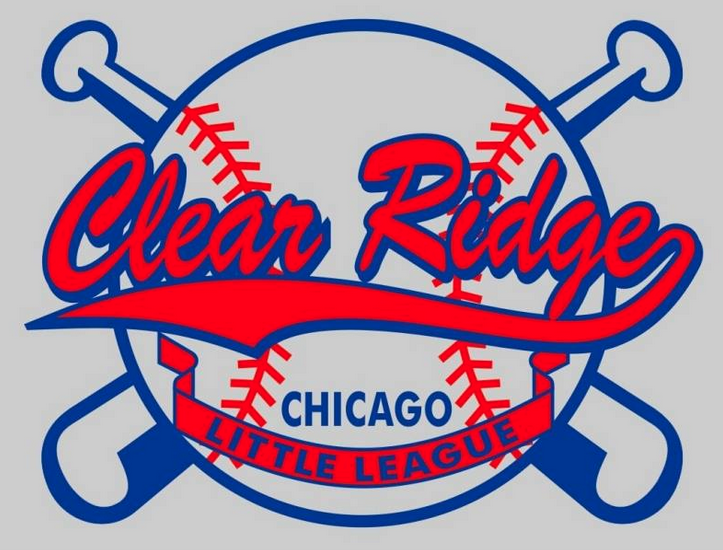 Those with questions about the petition are invited to call Tabares’ office at (773) 582-4444. 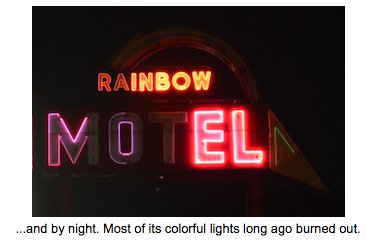 The Rainbow Motel has been around since 1954. Its tall sign was reportedly erected in the early 1960s so that motorists on the new Southwest Expressway (which opened in in 1964 and was later renamed the Stevenson) would see it clearly and easily. 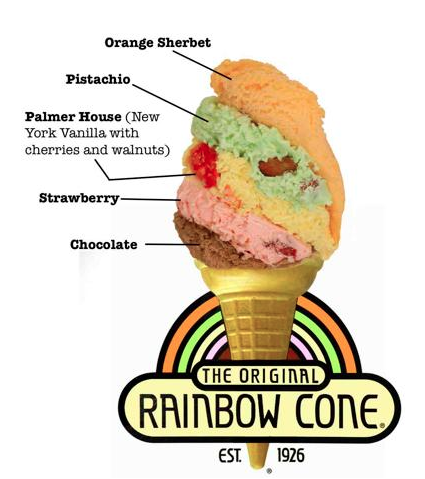 The Rainbow expanded in the 1970s when it absorbed what had been a fast-food restaurant, according to a WBEZ-FM report last year that quoted manager Sagar Patel. Over the years, its imaginative and occasionally outlandish “theme rooms” have included a pink palace, a space-walk room, a Valentine’s suite, a Las Vegas room, a “night in Paris” room and more.